A tachyon or tachyonic particle is a hypothetical particle that always moves faster than light. The word comes from theGreek: ταχύς or tachys, meaning “swift, quick, fast, rapid”, and was coined by Gerald Feinberg. Most physicists think that faster-than-light particles cannot exist because they are not consistent with the known laws of physics. If such particles did exist, they could be used to build a tachyonic antitelephone and send signals faster than light, which (according to special relativity) would lead to violations of causality. Potentially consistent theories that allow faster-than-light particles include those that break Lorentz invariance, the symmetry underlying special relativity, so that the speed of light is not a barrier. In the 1967 paper that coined the term, Feinberg proposed that tachyonic particles could be quanta of a quantum field with negative squared mass. However, it was soon realized that excitations of such imaginary mass fields do not in fact propagate faster than light, and instead represent an instability known as tachyon condensation. Nevertheless, negative squared mass fields are commonly referred to as “tachyons”, and in fact have come to play an important role in modern physics. Despite theoretical arguments against the existence of faster-than-light particles, experiments have been conducted to search for them. No compelling evidence for their existence has been found. 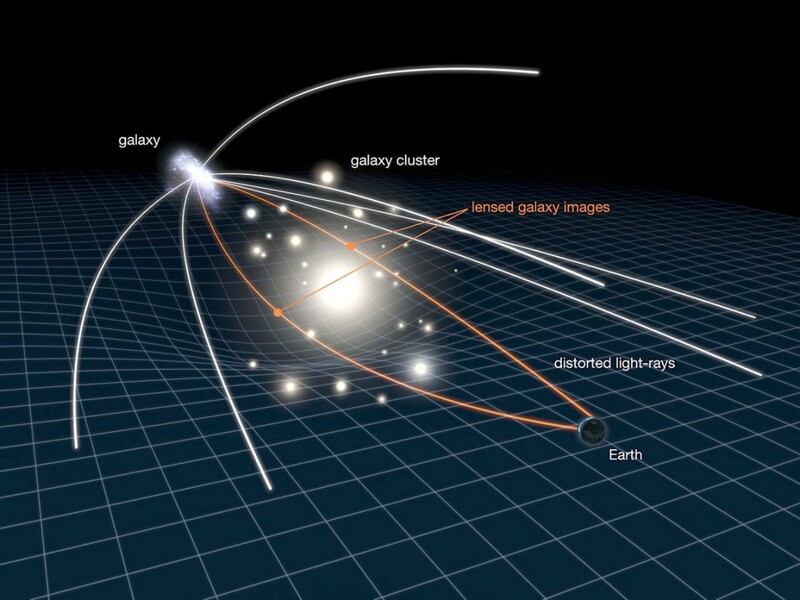 A gravitational lens refers to a distribution of plates (such as a cluster of galaxies) between a distant source (a background galaxy) and an observer, that is capable of bending (lensing) the light from the source, as it travels towards the observer. This effect is known as gravitational lensing and is one of the predictions of Albert Einstein’s general theory of relativity. Although Orest Chwolson (1924) or Frantisek Klin (1936) are sometimes credited as being the first ones to discuss the effect in print, the effect is more commonly associated with Einstein, who published a more famous article on the subject in 1936. Fritz Zwicky posited in 1937 that the effect could allow galaxy clusters to act as gravitational lenses. It was not until 1979 that this effect was confirmed by observation of the so-called “Twin QSO” SBS 0957+561. 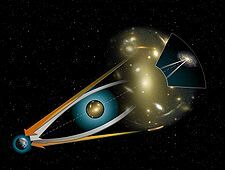 Spacetime around a massive object (such as a galaxy cluster or a black hole) is curved, and as a result light rays from a background source (such as a galaxy) propagating through spacetime are bent. The lensing effect can magnify and distort the image of the background source. Unlike an optical lens, maximum ‘bending’ occurs closest to, and minimum ‘bending’ furthest from, the center of a gravitational lens. Consequently, a gravitational lens has no single focal point, but a focal line instead. If the (light) source, the massive lensing object, and the observer lie in a straight line, the original light source will appear as a ring around the massive lensing object. If there is any misalignment the observer will see an arc segment instead. This phenomenon was first mentioned in 1924 by the St. Petersburg physicist Orest Chwolson, and quantified by Albert Einstein in 1936. It is usually referred to in the literature as an Einstein ring, since Chwolson did not concern himself with the flux or radius of the ring image. 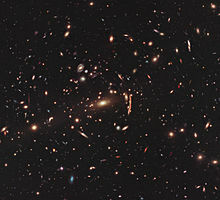 More commonly, where the lensing mass is complex (such as a galaxy group or cluster) and does not cause a spherical distortion of space–time, the source will resemble partial arcs scattered around the lens. The observer may then see multiple distorted images of the same source; the number and shape of these depending upon the relative positions of the source, lens, and observer, and the shape of the gravitational well of the lensing object. 1. Strong lensing: where there are easily visible distortions such as the formation ofEinstein rings, arcs, and multiple images. 2. Weak lensing: where the distortions of background sources are much smaller and can only be detected by analyzing large numbers of sources to find coherent distortions of only a few percent. The lensing shows up statistically as a preferred stretching of the background objects perpendicular to the direction to the center of the lens. By measuring the shapes and orientations of large numbers of distant galaxies, their orientations can be averaged to measure the shear of the lensing field in any region. This, in turn, can be used to reconstruct the mass distribution in the area: in particular, the background distribution of dark matter can be reconstructed. Since galaxies are intrinsically elliptical and the weak gravitational lensing signal is small, a very large number of galaxies must be used in these surveys. These weak lensing surveys must carefully avoid a number of important sources of systematic error: the intrinsic shape of galaxies, the tendency of a camera’s point spread function to distort the shape of a galaxy and the tendency of atmospheric seeing to distort images must be understood and carefully accounted for. The results of these surveys are important for cosmological parameter estimation, to better understand and improve upon the Lambda-CDM model, and to provide a consistency check on other cosmological observations. They may also provide an important future constraint on dark energy. Simulated gravitational lensing (black hole going past a background galaxy). According to general relativity, mass “warps” space–time to create gravitational fields and therefore bend light as a result. This theory was confirmed in 1919 during a solar eclipse, when Arthur Eddington and Frank Watson Dyson observed the light from stars passing close to the Sun was slightly bent, so that stars appeared slightly out of position. Einstein realized that it was also possible for astronomical objects to bend light, and that under the correct conditions, one would observe multiple images of a single source, called a gravitational lens or sometimes a gravitational mirage. However, as he only considered gravitational lensing by single stars, he concluded that the phenomenon would most likely remain unobserved for the foreseeable future. In 1937, Fritz Zwicky first considered the case where a galaxy could act as a source, something that according to his calculations should be well within the reach of observations. It was not until 1979 that the first gravitational lens would be discovered. It became known as the “Twin QSO” since it initially looked like two identical quasistellar objects; it is officially named SBS 0957+561. 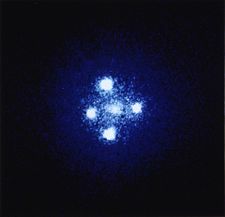 This gravitational lens was discovered by Dennis Walsh, Bob Carswell, and Ray Weymann using the Kitt Peak National Observatory 2.1 meter telescope. In the 1980s, astronomers realized that the combination of CCD imagers and computers would allow the brightness of millions of stars to be measured each night. In a dense field, such as the galactic center or the Magellanic clouds, many microlensing events per year could potentially be found. This led to efforts such as Optical Gravitational Lensing Experiment, or OGLE, that have characterized hundreds of such events. In general relativity, light follows the curvature of spacetime, hence when light passes around a massive object, it is bent. This means that the light from an object on the other side will be bent towards your eye, just like an ordinary lens. Since light always moves at a constant speed, lensing changes the direction of the magnitude of the light, but not the velocity. toward the mass M at a distance r from the effected radiation, where G is the universal constant of gravitation and c is the speed of light in a vacuum. 3D map of the large-scale distribution of dark matter, reconstructed from measurements of weak gravitational lensing with the Hubble Space Telescope. This image from the NASA/ESA Hubble Space Telescope shows the galaxy clusterMACS J1206. A similar search in the southern hemisphere would be a very good step towards complementing the northern hemisphere search as well as obtaining other objectives for study. If such a search is done using well calibrated and well parameterized instrument and data, a result similar to the northern survey can be expected. The use of the Australia Telescope 20 GHz (AT20G) Survey data collected using the Australia Telescope Compact Array (ATCA) stands to be such a collection of data. As the data were collected using the same instrument maintaining a very stringent quality of data we should expect to obtain good results from the search. The AT20G survey is a blind survey at 20 GHz frequency in the radio domain of the electromagnetic spectrum. Due to the high frequency used, the chances finding gravitational lenses increases as the relative number of compact core objects (e.g. Quasars) are higher (Sadler et al. 2006). This is important as the lensing is easier to detect and identify in simple objects compared to objects with complexity in them. This search involves the use of interferometric methods to identify candidates and follow them up at higher resolution to identify them. Full detail of the project is currently under works for publication. In a recent article on Science Daily (Jan. 21 2009) a team of scientists led by a cosmologist from the U.S. Department of Energy’s Lawrence Berkeley National Laboratory has made major progress in extending the use of gravitational lensing to the study of much older and smaller structures than was previously possible by stating that weak gravitational lensing improves measurements of distant galaxies. 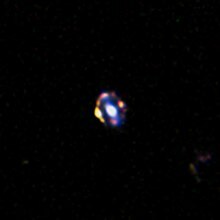 Astronomers from the Max Planck Institute for Astronomy in Heidelberg, Germany, the results of which are accepted for publication on Oct 21, 2013 in the Astrophysical Journal Letters (arXiv.org), have discovered the most distant gravitational lens termed as J1000+0221 using NASA’s Hubble Space Telescope. A research published Sep 30, 2013 in the online edition of Physical Review Letters, led by McGill University in Montreal, Canada, has discovered the B-modes, that are formed due to gravitational lensing effect, using National Science Foundation’s South Pole Telescope and with help from the Herschel space observatory. This discovery would open the possibilities of testing the theories of how our universe originated. Kaiser et al. (1995), Luppino & Kaiser (1997) and Hoekstra et al. (1998) prescribed a method to invert the effects of the Point Spread Function (PSF) smearing and shearing, recovering a shear estimator uncontaminated by the systematic distortion of the PSF. This method (KSB+) is the most widely used method in current weak lensing shear measurements. KSB’s primary advantages are its mathematical ease and relatively simple implementation. However, KSB is based on a key assumption that the PSF is circular with an anisotropic distortion. It’s fine for current cosmic shear surveys, but the next generation of surveys (e.g. LSST) may need much better accuracy than KSB can provide. Because during that time, the statistical errors from the data are negligible, the systematic errors will dominate.